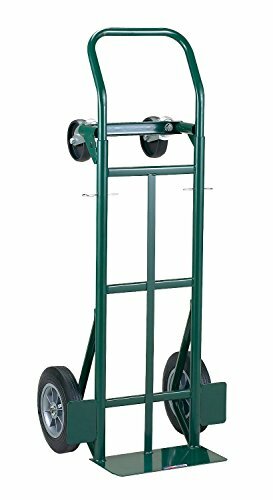 If you are constantly transporting heavy items from one place to another, you should consider buying a hand truck. Regardless if it’s for commercial or residential use, a hand truck can help to ease your burden and lessen the fatigue in your body. Hence, for this post, we are going to review the top 10 best hand trucks that we’ve found in the market. With the hundred choices available online, it’s easy to get overwhelmed by which model to buy. To ensure that you make the right decision, allow us to be your guide in choosing the right-hand truck for you. We will start with a budget-friendly hand truck from Cosco. Check out this three-in-one aluminum hand truck that can reduce your risk of injury and lessen muscle strain. Transferring items from one place to another has never been easier with this product. Also, thanks to its heavy-duty flat free wheels, you can pull it smoothly without exerting much effort. Stunningly easy to maneuver and ideal for a variety of uses, this hand truck can accommodate up to 1000 pounds. The quick one-hand conversion is also a handy feature to lessen the fatigue. It is made of solid aluminum that requires no maintenance at all and designed to last for a long time. If you are on a budget and still want to enjoy a quality hand truck for residential or commercial use, this product is for you. The Magliner two-in-one truck can be converted from two-wheel truck mode to four-wheel truck mode in just a few seconds. The 500-pound high capacity of this truck can help to reduce and provide ease of work, increasing your productivity in a day. Thanks to its solid and robust frame, you can easily transport items from one place to another. The hand truck is made of aluminum, making transportation a lot easier because it’s lightweight and easy to maneuver. What we like the most about this product is its modular design. It just means that there are no more welds to break, all parts can be replaced for longer service life. 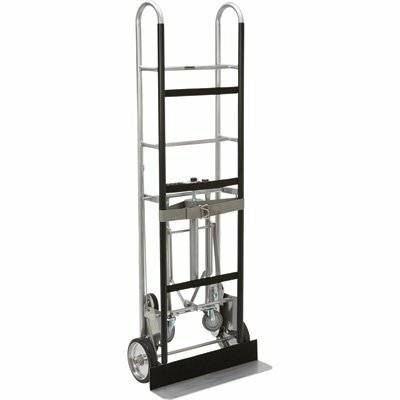 You can also lower the driver fatigue by reducing the muscle strain required for using this hand truck. Accessories are readily available and also compatible with other brands to achieve optimal convenience. Another product from Magliner, but at a lower price, is this aluminum hand truck with a horizontal loop handle. Similar to the previous product, it is also made with aluminum, making it easier to maneuver and carry around. The straight back frame can support up to five boxes at a time with its 500-pound capacity. This hand truck features a set of 8-inch mold-on rubber wheels that are great to use in city streets and even warehouses. Rest assured that the aluminum diecast nose plate and sturdy construction can last for a long time with proper use and maintenance. It is designed for heavy-duty use and reduces the body fatigue of the driver even when used continuously throughout the day. This two-wheel dolly is one of the most affordable models we have found so far that offers exceptional quality and convenience. Next, we have the industrial appliance truck from Roughneck. This hand-truck features robust steel construction with powder-coat finish for extra protection. You don’t need to worry about rust and corrosion when it comes to this product. The frame is also rubber-coated, making sure that the load is free from damage when placed. It features a set of two 8-inch aluminum center rubberized wheels that can roll smoothly when pushed. The retractable 4-inch, on the other hand, are designed to support heavier and bulkier items. 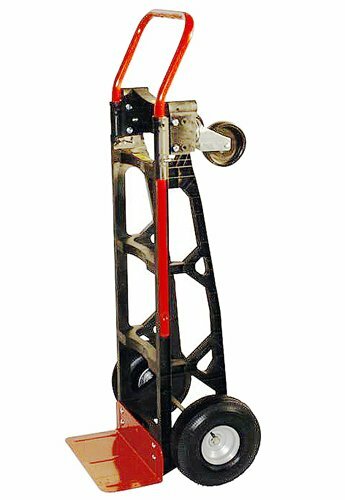 This hand truck features an auto-rewind ratchet belt for secure tightening of the load to the dolly. It’s a handy feature if you are planning to transport items from a distance. 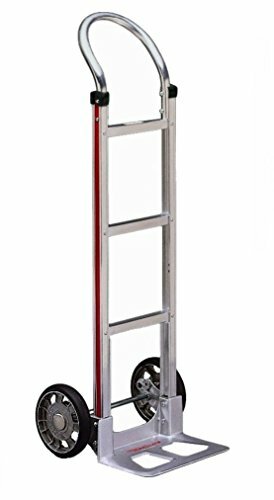 If you are looking for a hand truck for commercial use, check out this Tyke Supply aluminum hand truck. This commercial-quality hand truck is lightweight and ridged, making it easy to use. Aside from that, the six ¼-inch solid rubber tires can support heavy loads and will not break under extreme pressure. This hand truck is engineered for regular heavy-duty use. It also has two ergonomic handles to reduce the muscle strain when using the product. The nose plate is 18-inch wide and 7.7-inch deep to accommodate more loads. 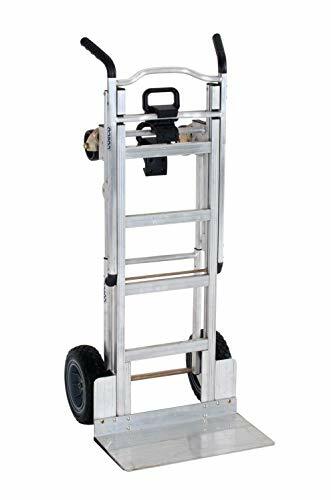 Of all the hand trucks we’ve reviewed so far, this is the only one that can rotate the whole wheel assembly, allowing the dolly to climb the stairs. Its maximum capacity is 550 pounds. If you have extra budget, check out this heavy-duty convertible hand truck from Harper Trucks. It can accommodate up to 700 pounds and features a dual purpose two-wheel dolly. Of all the hand trucks we’ve reviewed so far, this none is superior when it comes to durability. Specially designed for heavy-duty use, this is the perfect hand truck for you. The two position telescoping handle can be adjusted up to 62 inches, making it an ideal choice for tall loads. You can convert this hand truck from two-wheel configuration to four-wheel configuration in just a matter of seconds. It features a set of heavy-duty and flat-free 10-inch solid rubber tires and 5-inch durable swivel casters to support heavy loads. The wheel fenders are designed to protect the load from getting damaged. All in all, this product is a great choice for residential choice and an even better option for commercial use. Next, we have the Weco standard series steel drum truck with polyolefin wheels. Despite its small frame, this hand truck can accommodate up to 1000 pounds of heavy load. Its steel construction is built to last for a long time and can resist rust and corrosion. It is also designed to resist oil, chemical, and even moisture, making this an ideal choice for factory or warehouse uses. The combination of drain strand and drum truck makes it an excellent industrial choice. Moving items has never been easier with this product. You can also fold it for compact and easy storage when not in use. Milwaukee is known for manufacturing quality outdoor equipment and tools, and this product is not an exception. Check out this 40611 hand truck from Milwaukee. This nylon convertible truck with 10-inch pneumatic tires is perfect for both residential and commercial use. The tool is easy to install and easy to use. Since it’s made of lightweight rustproof fiberglass reinforced nylon polymer, maneuvering the hand truck is easy. To increase the rigidity of the product, the one-piece frame is fully-integrated. It’s solid and durable for heavy-duty use. You can convert this two-wheel vertical truck to a horizontal position should you want to load heavier items. The contoured cross-straps are designed to cradle a variety of objects. The Milwaukee hand truck proves that you don’t have to burn a hole in your pocket to have a quality hand truck. Lastly, we have another product from Milwaukee. 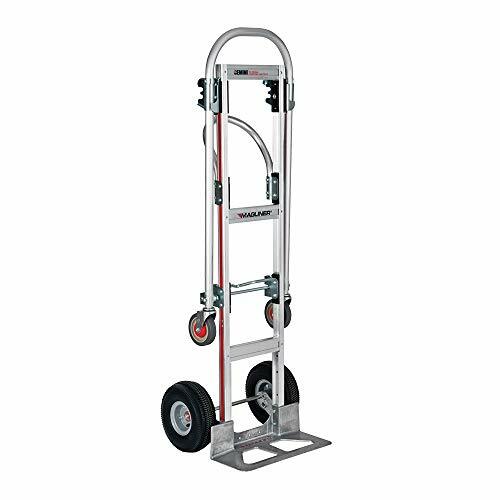 This appliance hand truck comes with a ratchet belt tightened to secure large appliances. If your work revolves with transporting appliances from one place to another, you should consider this product. This is made explicitly for heavy-duty purposes and offers you to 800-pound load capacity. It is fully powder coated finished to ensure it does not leave any stain on the item that it carries. The automotive seat belts are used for increased strength. Compared to other hand trucks, rest assured that this model does not leave any black marks on the floor when used. It also features a Duo Durometer protective pads to shield the load from any damage while you are transporting.